We get the ferry from Denmark to Norway. By avoiding the bridge to Oslo we avoid a lot of highway running. 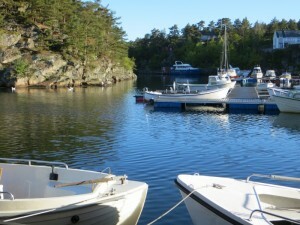 Our first night is spent in a cabin on a small marina. We are knocked out by the beauty of this country from the moment we hit the road. 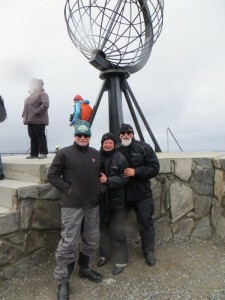 Our aim is to get to the very top of Europe – Nordkapp. 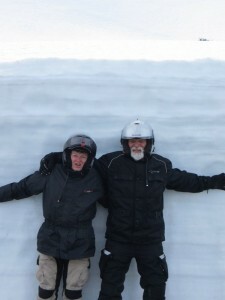 We met our traveling companion, Dave Hand, in Alaska in 2012. 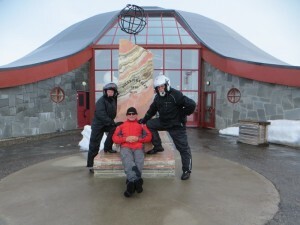 We rode to the top of North America together so there’s some synchronicity in traveling to the top of Europe together. Nordkapp is much further north than Prudhoe Bay in Alaska so we don’t know what the ride has in store for us. We ride through as many national parks as we can. The scenery is breathtaking. 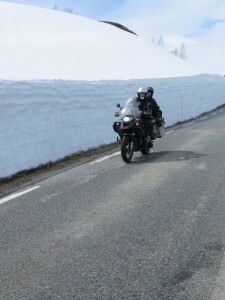 We ride along pristine roads with snow piled high on both sides. 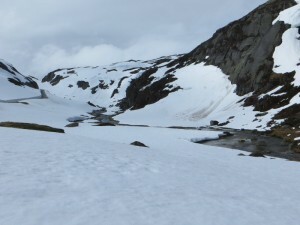 There are frozen lakes in valleys that lead to magnificent fjords. 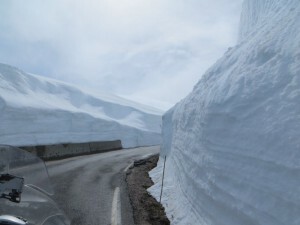 There are high passes where the temperature drops to 1 degree and the snow falls. 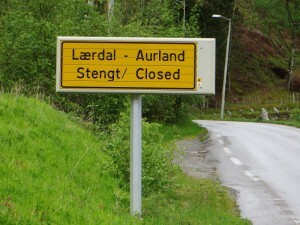 Some roads are still closed. Others take us through an incredible network of tunnels. The longest is 24.6 kilometres. Another has a roundabout where two tunnels intersect. 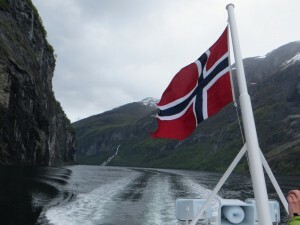 There are ferries to get across other fjords. Geiranger Fjord is one of the most beautiful with waterfalls cascading down to the water’s edge. 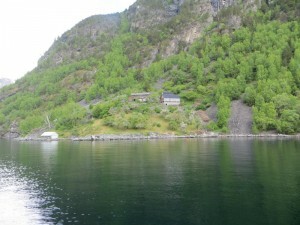 It is a UNESCO world heritage site because of its natural beauty and the old farms that have been preserved, perched high above the fjord. At one, we are told, the farmers would tie their children to trees so they didn’t wander off the edge of the land and plummet into the water. There seems no end to the beauty. Even when we take the main roads the scenery is stunning. 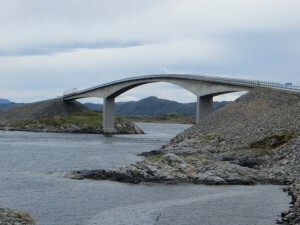 And the Norwegians go out of their way to create tourist roads like the Atlantic Highway. 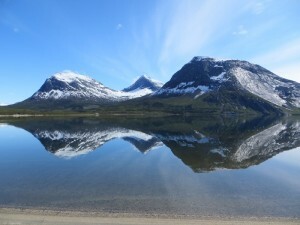 It’s a long road to the Arctic Circle and we all feel it is a great achievement. It’s snowing and the snow is piled high everywhere. Above the Arctic Circle nothing changes. There are still towns, industry and paved roads, unlike Alaska. 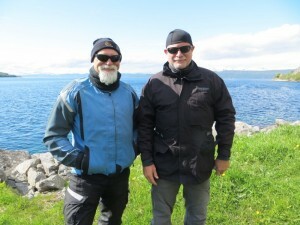 At Narvik we meet a young Norwegian biker, Gaute from Tromso. He invites us to his home for a traditional Norwegian meal of reindeer stew. We have a fun night with Gaute, his wife Kirstin and their daughters, Sigrid and Frida. 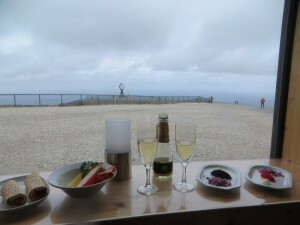 At last, after two weeks we finally make it to Nordkapp – 70° 10’ 21”. It’s blowing a gale. It’s bloody cold but we made it. What an achievement! To celebrate we have a glass of bubbles, some King Crab, salmon and caviar. 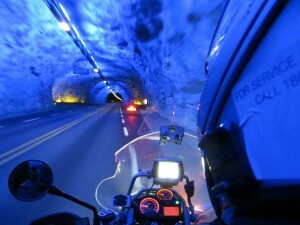 Tomorrow we begin the ride south heading into Finland.